Rotator cuff tendinosis is one of the most common causes of shoulder pain. The pain caused by rotator cuff tendinosis is usually on the outer side of your arm. The pain might only occur when you move the arm in certain ways. The pain of rotator cuff tendinosis can also cause severe pain at night. Night pain can be exhausting and very debilitating. The rotator cuff are a series of four muscles that help move the shoulder. They are located underneath your deltoid and the other larger muscles around the shoulder. Without a proper functioning rotator cuff, the shoulder will hurt, and it will not move properly. Tendinosis implies that the rotator cuff tendon is actually wearing out. The tendinosis tends to occur at the attachment of the rotator cuff tendon to the top of the humerus. The most commonly affected rotator cuff tendon is the supraspinatus. Why tendinosis is more common in the supraspinatus is a bit of a mystery, but any of the four tendons can be affected. 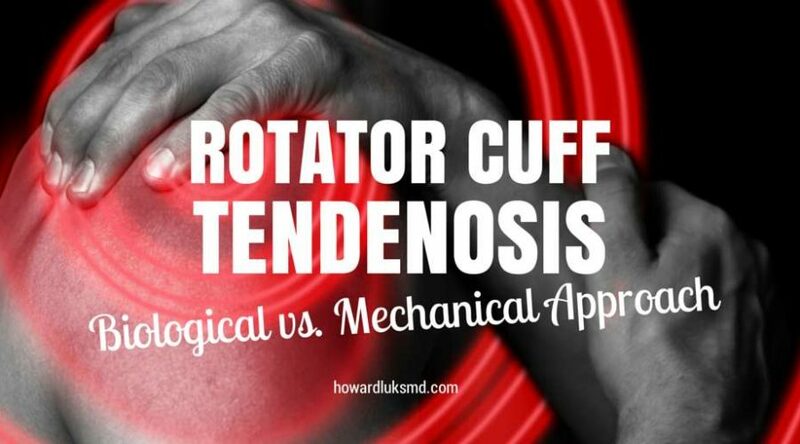 When the rotator cuff is affected by tendinosis the tendon itself starts to degenerate. I like to use the analogy of your favorite pair of blue jeans. One day your blue jeans are no longer blue around the knee… they are white and frayed. Another few weeks later there is a small hole… and eventually there is a big hole. While tendinosis is more common in people beyond their fourth decade, it can affect anyone. Initially the rotator cuff looks fine visually, but it is changing at a microscopic level. In a short while the tendon will appear frayed and rough. As the fraying and degeneration progresses the rotator cuff can start to detach from the bone. We call this a partial rotator cuff tear — and tendinosis is the most common cause of partial tears of the rotator cuff. As more and more of the tendon becomes involved, a full thickness tear of the tendon will eventually occur. That means that a portion of the rotator cuff is no longer attached to the bone. Why Does Rotator Cuff Tendinosis Hurt So Much? The rotator cuff is not the only tendon in our body that suffers from degenerative tendinosis. The achilles tendon is also commonly affected and the best known form of tendinosis is tennis elbow. In all of these cases, the degeneration and partial tearing of the tendon leads to significant pain. We believe that the pain comes from excessive strain on the portion of the tendon that remains intact… but we’re not really sure. Treatment of Rotator Cuff Tendinosis. 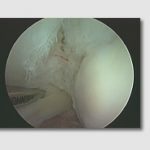 For nearly a decade we have treated rotator cuff tendinosis with a “mechanical” approach. 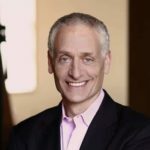 That means that we treated the fraying or tearing caused by the tendinosis — instead of treating the underlying cause of the tendinosis-or the biology of the disease. So, we would try physical therapy, injections and on occasion we would resort to surgery. At the time of surgery we would smooth out the roughened tendon and perhaps some of the inflamed tissue around the tendon. The results in many were reasonable… but we did NOT alter the biology of the rotator cuff, nor could we stop the progression of the tendinosis. Those times might be changing. A small company has developed a “bioinductive” patch that has been shown to be able to alter the biology of rotator cuff tendinosis or degeneration. 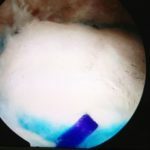 That means that instead of “cleaning out” the shoulder in patients with rotator cuff tendinosis or partial rotator cuff tears, we may actually be able to restore the integrity of the rotator cuff, heal partial tears and reverse the degeneration with a straight forward arthroscopy. Stay tuned to this blog for more on this topic… and the most common cause of shoulder pain.